This third issue Exchange has been delayed for two months but I like to think the disruptions to my schedule and reasons for putting it off have been worthwhile. Since publishing last time, I have attended three significant events. The first was the Global Business-as-Mission (BAM) Congress in Chiang Mai, Thailand. It capped the culmination of the initial research phase of the virtual BAM Think Tank. You can learn much more at http://bamthinktank.org/, and / or read my initial reflections on the event in my blog post – “Sawasdee-cup from a Chiang Mai Global BAM Congress Delegate” (available here). As I suspected, a great deal that is to come from the Global Congress will take years to unfold. The final reports from all sixteen issue groups, which presented their preliminary findings at the Congress, will be vetted for release in the Fall of this year. The second event was a half-day presentation of Mission Nexus (http://www.missionexus.org/). Missio Nexus came to Atlanta as part of their Seven-City Connection Tour to help build relationships with mission folk in Philadelphia, Chicago, Orlando, Atlanta, Los Angeles, Colorado Springs, Dallas, and surrounding areas. Steve Moore, Missio Nexus President, brought a report from the Executive Summary of their recent Missio Nexus 2013 CEO Survey: Navigating Global Currents, which surveyed more than 180 mission agency leaders and their views on today’s toughest challenges and ripest opportunities. The Executive Summary can be purchased from the Missio Nexus web site for just $9.95 (a bargain!). The event also featured a talk by Paul Borthwick, author of Western Christians in Global Mission: What’s the Role of the North American Church? This should be read in (or to) every local church in the United States. Mission practice is changing and Missio Nexus and Paul Borthwick are at the forefront of the conversation on where it is going and how we are to get there. The third event was the Marketplace Revolution ’13 U.S. National Gathering hosted by Launch Chattanooga (http://www.launchchattanooga.org/) and emceed by Rudy Carrasco, Partners Worldwide U.S. Regional Facilitator (http://www.partnersworldwide.org). There is a three-part series of short articles in this issue of Exchange concerning that event, one of the business owners who went through the Launch Entrepreneur Training Program and recently celebrated the Grand opening of All Dogs and More, and finally, an exploration of how Scott Soltau, a Launch co-founder, found grace in his own business development even as he was extending grace to the at-risk community in Chattanooga. from my book, Eden’s Bridge: The Marketplace in Creation and Mission in this issue of Exchange as it pertains specifically to our understanding of the marketplace in Christian perspective and to encourage godly leaders to lay down territorialism and fear in light of God’s abundant grace to fulfill every need. As always, I encourage readers to respond to the articles in this issue of Exchange at the individual pages on the www.edensbridge.org web site. I also encourage readers with an interest in the integration of Christian faith and business practice to submit relevant articles, including book reviews. Exchange: The Journal of Mission and Markets is a copyrighted publication of Eden’s Bridge, Inc. (a not-for-profit corporation) of 991 Lancelot Drive, Norcross, GA 30071. Exchange and Eden’s Bridge can be reached at davedoty@edensbridge.org. Portions or all of Exchange may be redistributed or reprinted within two restrictions: 1)materials repreinted in Exchnage by permission of the original authors may not be reprinted, 2) any materials reprinted in any printed or electronic publication or redistribution. To learn more about Eden’s Bridge, please visit our blog at http://www.edensbridge.org. Tax deductible support for Eden’s Bridge or sponsorship for Exchange may be mailed to the Eden’s Bridge address above or contributed via the PayPal account of davedoty@edensbridge.org. Thank you for your support and please keep our ministry in prayer. Shalom, Dave Doty. God is the original and ultimate entrepreneur. In the beginning of Genesis 1, through Jesus (Hebrews 1:2), He created something incredible out of chaos. At the end of Genesis 1, they created man and woman in their divine image and told them to take dominion over the earth, be fruitful, and multiply. In order for us to accomplish these three mandates we have to use the divine characteristics of entrepreneurship, including but not limited to faith, intelligence, creative ability, and resourcefulness, all of which God displayed as He manifested the universe. The most widely accepted definition of entrepreneurship was coined thirty-seven years ago by Harvard Business School professor Howard Stevenson. He defined it as “The pursuit of opportunity without regard to resources currently controlled.” This definitely describes God’s approach to creation, but with a major exception. He definitely pursued the opportunity to “invent” the earth and mankind, but He wasn’t worried about resources, knowing He controls all of them anyway. Let’s discuss some of the many characteristics of successful entrepreneurs and how they relate to operating effectively with the mind of Christ in the kingdom of God. Faith – God spoke the world into existence, but He first had to believe that His words had creative power. Hebrews 11:6 says it is impossible to please God without faith. Similarly, it is nearly impossible to be entrepreneurial without strongly believing in yourself and in the ideas that you have. Accomplishing anything significant for God requires the constant application of your faith. God believed in Himself when He created the universe. You must believe in Him to accomplish the assignments He gives you. Integrity– God is the same yesterday, today, and forever (Hebrews 13:8). His character never changes like shifting shadows (James 1:17). It is impossible for Him to lie (Hebrews 6:18) and His word always comes true (Isaiah 55:11). One of the main reasons Jesus got angry in the temple, threw out the businesspeople, and called them thieves is not because they were doing business. It is because they were doing business dishonestly! Always do right. And always do what you say and say what you do. Under-promise and over-deliver. You will not be in business very long if your word cannot be trusted. Always remember, do not let your charisma take you places where your character cannot keep you there, because a good name is worth far more than great riches (Proverbs 22:1). Purpose – True entrepreneurs are not just out to make a buck. They want to be part of something bigger than themselves, i.e. revolutionary ideas, changing lives, new inventions, fresh innovations, etc. God gives life to purpose and purpose to life. He was not random or haphazard in what He did at the genesis of the world. He wanted to do something that had never been done before – design a new being with whom He could demonstrate the immensity of His love. He was so purposeful that He already had a plan in place when Adam messed up the perfect set up (John 3:16). Purpose should proceed all of your planning. For those in business, why are you in business? For those considering making the jump, why do you aspire to be an entrepreneur? Your motivation for business should have everything to do with why God created you. Intelligence – Entrepreneurs do not always get the best grades in school, but they are usually very bright in that they constantly use their brains think through problems, issues, and opportunities. Unfortunately, some Christians think that their intellect is no longer needed once they commit their lives to Christ. The total opposite is true. When we get saved, we are to stop thinking, but we must commit all of our minds to Christ and allow him to transform how we think and what we think about (Romans 12:2). When we think like he thinks we will be able to tap into an eternal knowledge base that surpasses all human understanding. In Christ is hidden all the treasures of wisdom and knowledge (Colossians 2:3). So if you need a business idea, ask the One who has all the ideas. Creativity – This one goes right along with intelligence. To see a simple example of God’s creativity, just take a walk outside and look at how many different types of plants, trees, and flowers He made. Botanists estimate that there are more than 10,000 species of flowering plants. Jesus also sets a great example of using his divine creativity. If you look at all of his miracles, very seldom do you see him performing duplicates. John mused that all the miracles Jesus did could not be contained in all the books in the world (John 21:25). No doubt there was a lot of creative juices flowing during his life. Having the mind of Christ – powered by the Holy Spirit – gives you a competitive advantage over others without him. John 14:26 states that the Holy Spirit will teach us all things, so you can best believe he will reveal witty ideas to you that no one has ever thought of (1 Corinthians 2:9). How are you exercising your creative juices? Talents/Gifts – We know that God is all-powerful and has no lack of ability to get things done. What’s also true is that He gave every person a unique set of talents, abilities, gifts, and skills. He expects you to use – and improve – what you have been given (Matthew 25:23). Entrepreneurial people are excellent at using their talents intelligently and creatively to produce value. Do you know what special talents and abilities you have? How are you using them intelligently and creatively? Perseverance – Life can be very challenging and so can business. God knows this firsthand. He faithfully endures through His creation’s blatant rebellion, even after He freely gave them His most valuable possession. Jesus had to persevere through a tortuous trial and execution in order to fulfill his purpose. Perseverance involves a great deal of sticktoitness, resourcefulness, and a never-say-quit attitude in the face of seemingly overwhelming obstacles. It takes a persevering mindset to endure what he did and still come out as the champion. Jesus expects us not to just look at his example, but to also follow it as we face trials of many kinds. Patience – Patience is a close brother of perseverance. Delayed gratification is an invaluable asset. You have to be confident that “your vision is yet for the appointed time; It hastens toward the goal and it will not fail. Though it tarries, wait for it; For it will certainly come, it will not delay” (Habakkuk 2:3). God is patient with us, because He sees our end from our beginning (Isaiah 46:10), and He knows greater things are in store for us than what we may be currently experiencing (Jeremiah 29:11). Entrepreneurs are intimately acquainted with the principle of Seed, Time, and Harvest. They realize that a proper investment now of their time, talents, and treasures, will yield a profitable return in due season. Patience allows you not make hasty decisions. And while you are waiting for certain things to happen you are still planting more seeds. Follow-through (vs. procrastination) – God’s plans His work and then works His plans. He does not wait when He’s supposed to be working. He does not delay when He’s supposed to be doing. He is perfect love, so He has no fear to keep Him from moving forward. Entrepreneurially minded people take action more than they take breaks. Even in the times when it seemed like Jesus was delaying, he was very purposeful in his actions. If you already have the vision and the permission from God, what are you waiting for? Courage – Courage turns your faith in action. Courage is often associated with taking risks. Interestingly, God took a risk creating human beings with the free will to reject Him. God took a risk creating a ransom plan by sending His son Jesus to redeem those who rejected Him. God takes a risk every day by allowing people to call themselves Christ-followers, even though we do not always do what Jesus did and say what he said. God is courageous, so He did not give us a spirit of fear, but a spirit of power, love, and a sound mind (2 Timothy 1:7), which we are to use to bring the realities of heaven down to earth. Solutions-driven – Entrepreneurial people spend the majority of their time solving problems, generating value, and fostering positive change for themselves and others. They do not entertain pity parties. They waste little time complaining about things they either have no power over or are not intending on doing something about. They are all about blessing others through the intelligent and creative application of their time, talents, and treasures. They do not withhold good from people, because they realize it is in their power to do good for them (Proverbs 3:27), which is what the true Gospel of Jesus looks like in action (James 1:27). God sent Jesus as the #1 solution for our problems. How are you using Jesus to solve the world’s problem? Hopefully it is easy for you to see how Jesus exercised each of these entrepreneurial characteristics while he lived on the earth. Therefore, if we want to be like Christ, we must embrace the mind of Christ (1 Corinthians 2:16), which was very much entrepreneurial. In order to bring the kingdom of God from heaven down to earth in a literal sense, we must utilize Holy Spirit-inspired entrepreneurial ideas to do good works, by turning spiritual truths into practical, holistic solutions that bring real, positive, lasting change to people’s lives. That is when the world will really see our lights shine and glorify God in heaven! Paul Wilson Jr. is the co-founder and President of Kingdom Business University, which trains current and aspiring entrepreneurs to grow profitable and sustainable businesses by teaching innovative business best practices that are built on eternal Biblical principles. He is a social entrepreneurship educator and consultant, providing dynamic leadership and marketing solutions to help grow businesses and organizations that strengthen communities. Paul has been a champion for spiritual empowerment, economic advancement, and community development for over a decade and has consulted or spoken to several organizations including the National Football League (NFL), Fortune 500 Companies, small businesses, trade organizations, and several churches and schools all over the country. Learn more about Paul Wilson, Jr. at http://www.paulwilsonjr.com. David Livingstone has been both missionary icon and missionary villain. For many he was the epitome of mission pioneering and for others an imperialistic missionary paternalist with few if any fruit. It is from this controversial figure we in the 21st Century can learn when we discuss socio-economic and spiritual transformation in communities. 1) People had to be set free from sins and practices (such as superstition) that prevented them from living lives that honour God. The spread of the Good News of spiritual freedom in Christ, or Christianity, was therefore of utmost importance to Livingstone[i]. The Holy Spirit empowers people to live holy lives and move away from sin. That would enable social change when more and more people follow that example. 2) People had to be set free from cultural practices that prevent social and intellectual development, including slavery. Therefore there is a need to encourage a cultural value system that will facilitate education, health and law and order. The chiefs abused their powers to enslave their own people. To end the slave trade a change in culture was needed from within Africa. 3) People had to be set free from poverty that encourages people to sell others into slavery. Economic development in Africa had to be facilitated through commercial activities. Commerce became a key building block of transforming communities so that slavery could stop. Livingstone’s belief in Christianity, Civilisation and Commerce as a way to end slavery and encourage social transformation had much deeper roots than his own passion. It goes back to William Wilberforce and the abolitionist movement which significantly coincided with the start of the British missionary movement. Legitimate commerce, coupled with the gospel, would cut off the slave trade at its source in Africa. Wilberforce’s own vision for a better world “lay in the transformative potential of faith and business. … It was in pursuit of this vision that he initiated radical social transformation on a global scale”[ii]. Because Christianity and legitimate commerce both had human liberty at their core, they were needed for social reform. Rob Mackenzie emphasises the importance of the abolitionist movement’s thinking on Livingstone when he attended a meeting in Exeter Hall in the Strand by the Society for the Extinction of the Slave-Trade and for the Civilisation of Africa[iii]. “There it was proposed that Africans would only be saved from the slave-trade if they were woken up to the possibilities of selling their own produce; otherwise chiefs would continue to barbarically sell their own kind to pay for the beads, cloth, guns and trinkets they coveted. Commerce and Christianity could achieve this miracle, not Christianity alone’. The discussion of the relationship of Christianity and civilization was therefore not a new idea. It had already been hotly debated in missionary circles in the 1790s and it can be argued it was the response to the social and economic transformation the UK experienced during the revival movements that swept the UK in the second half of the 18th Century. The abolitionist ideals of social transformation through commerce and Christianity became so inspirational that Henry Venn (Church Missionary Society General Secretary from 1841-1873) made abolitionism through commercial enterprise a central aspect of his mission strategy. Cultivating contacts with industry, Venn enlisted the support of a Christian manufacturer who agreed to import cotton at the minimum profit margin. This enabled Venn to set up the Nigerian cotton industry to provide African chiefs with a viable economic alternative to the slave trade[iv]. Livingstone believed that the arrival of honest traders and missionaries would provide the opportunity to exchange the natural resources of Africa for European trade goods. This would undercut and end the slave trade, leaving the possibility of the growth of Christianity and the development of a more prosperous African society. Livingstone tried to find suitable bases “from which Christianity, civilization and commerce could play their role in transforming Africa without the violence, injustice and slavery which he believed had characterized the meeting of European and African heretofore”[v]. During his visits to the UK Livingstone discussed the potential for trade and investment in Africa with business leaders. Christianity had been used by imperial powers to open areas for expansion and to pacify communities. Christianity became ‘the religion of the white-man’ and of the oppressor. Civilisation had been used to impose the will of imperial powers and to conform communities to the example of “Civilised Europe” in order to produce goods for the “Mother country”. Civilisation became synonymous with colonialism and oppression. Commerce had been used to advance the economic interest and self-enrichment of imperial powers, large companies and individuals such as Cecil John Rhodes while using the natural resources and cheap labour of local communities. Commerce became synonymous with multi-national capitalism that enriches a few and impoverishes the masses. Livingstone’s dream of Christianity and commerce, combining to produce developmental ‘take-off’ in Africa’s development did not materialise the way he envisaged. The demand of industrialised countries for ivory, combined with the East African slave trade, was a barrier enough even before the powerful worldwide imperialist expansion finally killed it. Other factors discouraged investment such as Africa’s geography and health conditions that makes transportation and trade difficult. People still have spiritual needs, but with the problems related to the term Christianity, it might be needed to return to the roots of Christianity, the Bible, and start talking about Biblical Faith instead of Christianity. Ron Sider[vii] argues that certain religious worldviews tend to create a fatalistic attitude towards poverty. A South African bishop once said that people in the rural areas in South Africa are so fearful of evil spirits that they do not take initiative to improve their lives. People can be set free from the fear of evil spirits and experience total renewal through the life-giving ministry of Jesus Christ. People need to be set free from values and cultural practices that prevent social-economic and emotional well-being. Society needs to be transformed according to Biblical principles from within the community. It is therefore better to talk about Social Transformation instead of Civilisation. Social problems are also the church’s problems and the church must deal with them. The church must direct itself towards transforming society and not to try to escape from it. People still have physical needs and need employment to provide in these needs. Enterprise Development that benefit a whole community is needed and not just Commerce that can give the impression of enriching just a few. It is therefore better to talk about Enterprise Development than of Commerce in order to indicate this qualitative difference in business activities. Biblical Faith: Bible becomes the norm for life and conduct and not perceived Western traditions. This brings people into a personal relationship with God to experience spiritual freedom, transformation and changing behavior and culture. Christians get the courage to start businesses through which they can earn a living for themselves and their families and through that glorify God. These believers then transform the community around them through encouraging a life-style based on the Biblical message that results in improved community care. Social Transformation: The Biblical principles are lived out. Communities are helped to develop a value system that facilitate trust and responsibility; increase productivity; and enable communities in caring for one another. Communities and individuals experience emotional and social freedom. Greater involvement from Christians in community structures facilitate improved social care and the eradication of negative values in the community. They can start social enterprises such as trading networks, low cost housing, services for the poor in the community and environmental initiatives as business initiatives to generate income for the community[viii]. This involvement is a witness and opportunity to spread Biblical Faith. Enterprise Development: local communities take control of their own economic development. Local job creation and sustainable wealth creation is encouraged. Companies and individuals from outside are encouraged to invest in sustainable commercial activities. Education provides the basis for enterprise development. Economic and physical freedom is experienced and economic transformation is facilitated. Enterprise Development includes the provision of capital for the poor to earn their own way through for example micro-loan programmes[ix]. Also increased trading opportunities for local business people, access to markets, and the development of fair trade initiatives. Enterprise development then becomes a means of church planting, social service and transformation, community building and grappling with unjust practices. 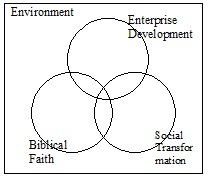 The relationship between Biblical Faith, Social Transformation and Enterprise Development: The best way to understand the relationship is three overlapping circles that facilitate developing self-sustainable communities of Christians that transform their society through adhering to God-given principles. With Christ at the centre, these communities of believers expand the overlapping area so that Christ will become increasingly the centre of the life of their societies. 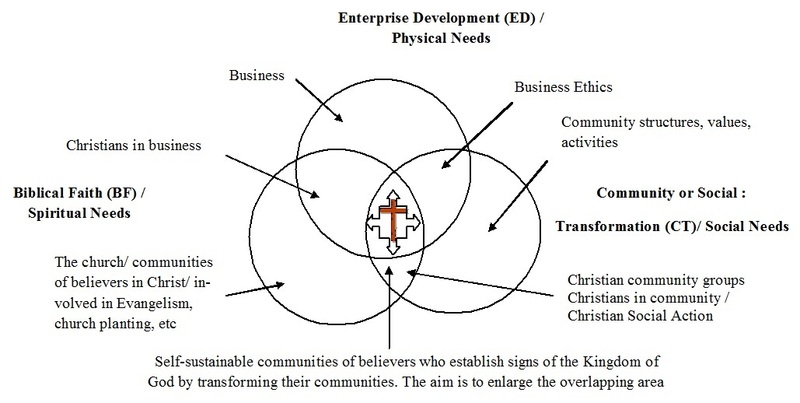 At the heart of this understanding of the relationship between Biblical Faith, Social Transformation and Enterprise Development is that the Kingdom of God needs to become a reality in a society or community. The already and not yet character of God’s Kingdom means that the Church and its mission constitute an interim sign. The Church points humanity backward to its origins in God’s creation and forward to the present and coming Kingdom in Jesus Christ. Livingstone’s vision to develop Africa spiritually, economically and socially had a profound impact on the global mission movement. For example David Scott developed the Blantyre Mission in present day Malawi as a small missionary community intended to act with the cooperation of the African Lakes Company as a cultural and economic as well as religious catalyst within African society[x]. This vision also finds its expression in the concept of holistic mission where the gospel not only transforms individuals but has ‘transforming consequences for societies, for trade and economics, for law, and for human rights” [xi]. Livingstone’s dream of Christianity and commerce, combining to produce developmental ‘take-off’ in Africa’s development is becoming a reality across Africa. The church in Africa grows rapidly. Many churches and ministries are taking steps towards a more Kingdom-orientated Model of understanding the relationship between Biblical Faith, Social Transformation and Enterprise Development. CMS Africa for example is involved in exciting Business as Mission initiatives (www.bamafrica.org) while the Samaritan Strategy (www.samaritan-strategy-africa.org) encourages social transformation and enterprise development out of a better understanding of the Biblical message[xii]. Christian micro-finance initiatives such as Opportunity International and Five Talents provide capital for enterprise development while changing the values in the communities where they work. The growing integration between Biblical Faith, Enterprise Development and Social Transformation has the potential to decrease dependency on so-called Western resources. Africa is now seen as a continent of hope despite remaining challenges such as corruption. Born within the Abolitionist Movement, David Livingstone’s vision of Christianity, Civilisation and Commerce had a profound impact on the mission movement in the 19th Century. Unfortunately this vision had been distorted by colonialism and imperialism. Many Christians and mission initiatives became reluctant to implement this vision and shied away of commerce and social involvement. Fortunately there are a growing number of Christian initiatives today that take the vision seriously. The challenge for these initiatives is to develop a Kingdom Model of ministry that integrates the different aspects of Livingstone’s vision. In a globalised world this Model is more than ever needed either it be in well-reached communities in Africa or unreached areas of Asia and the Middle East. In a fragile ecological environment we have to go beyond the Kingdom Model and put it within the framework of environmental care as described in the Quadruple Bottom Line Model of mission. Hopefully there will be many Christian leaders who will venture into what could become very excited possibilities. [iii] Mackenzie, Rob (1993), David Livingstone: The Truth behind the Legend. Fig Tree Publications, Chinhoyi, Zimbabwe, p.47. [xi] Sogaard, Viggo (2004) Evangelizing our World: Insights from Global Inquiry, 2004 Forum for World Evangelization, Thailand, September 2004, p.59. [xii] See Miller, Darrow L and Allen, Scott (2005) Against All Hope: Hope for Africa. [xiii] See Inayatullah, Sohail: “Spirituality as the Fourth Bottom Line” at www.metafuture.org/Articles/spirituality_bottom_line.htm for a non-Christian perspective on the Quadruple Bottom Line.